Are you a foody looking for healthier alternatives? Come and be inspired at Whole Earth, the first and only Thai- Peranakan- Vegetarian restaurant. Situated on the charming Peck Seah Street in Chinatown, Whole Earth will ravish your most sinful appetite. Their must-try dishes include the Oatmeal Tofu, Assam Pedas, Olive Rice,Yam Treasure Ring, Nonya Curry and Sambal King. You'll also die for their Kong Bah and Penang Rendang, for which the meat is replaced by some delicious pan-fried mushrooms. 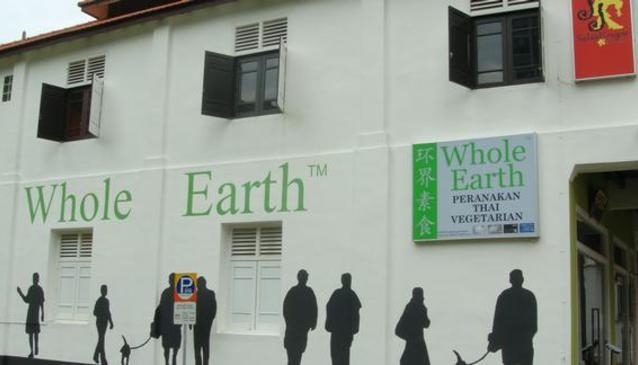 At Whole Earth they proud themselves for serving wholesome food free from any mock meat and MSG. Service is promt and pleasant.